Two vacuum systems are required to reach the low pressures in PVD systems. The first used to produce a "rough" vacuum down to about 0.030 Torr (one Torr is 1/760 of standard atmospheric pressure). Our roughing pump is an oil-based pump but contains a special silcon-based oil that allows us to safely pump oxygen. It takes about 30 minutes for us to reach 30 mTorr. Once we attain the rough vacuum, we close off the roughing pump lines and open the cryopump. Cryopumps have a front section of vanes at about 80K which freezes out water vapor, a major residual gas. Behind that section is a volume of activated charcoal held at about 12K, which absorbs all other gases. the cold temperatures are created by a refrigerant system run by a large compressor and high-pressure helium lines. With this cryopump, we can reach ultimate pressures slightly below 1e-7 Torr. (This is about one sixth of one billionth of an atmosphere!). Normally, we reach 1e-6 Torr in about 2 hours of pumping, and this is a fairly standard pressure for depositing coatings. Other vacuum pumps (diffusion pumps and molecular turbopumps) could be used in place of the cryopump. 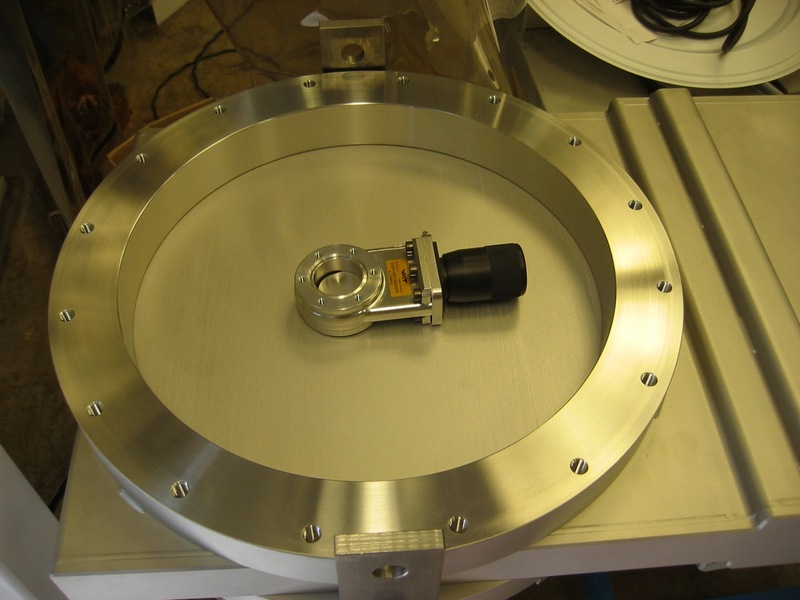 We chose the cryopump because it is clean, mechanically simple, and has enormous pumping capacity for water vapor. However, the cryopump must be cycled to room temperature and have its trapped gases removed by a separate vacuum system periodically, or it loses efficiency. We open and seal off the various vacuum systems by means of vacuum gate valves, both made by VAT. The large 16-inch gate valve can be opened, closed, or put at an intermediate position to allow us to control the pressure in the chamber. Another part of the vacuum system are two "quartz" heating lamps. These are 500W lamps that are used to heat the interior of the chamber, to drive off water. Water is the dominant residual gas in the chamber; as a polar molecule it sticks tightly to surfaces, so heating helps to release it from the surfaces so that it can eventually be trapped by the pumps. 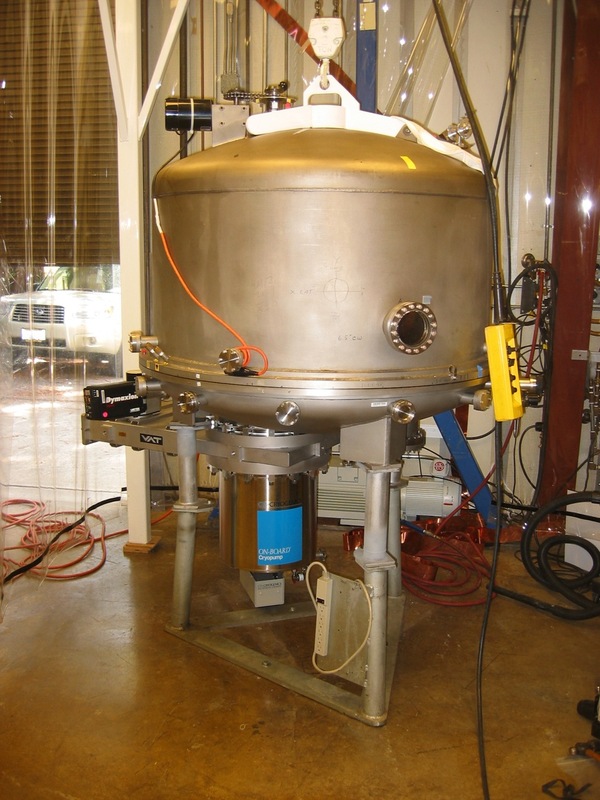 (left) Our chamber during re-buildling, showing the 16-inch cryopump (metallic cylinder with blue label plus box under the tank to the left) and the roughing pump (ivory-colored, on floor behind the chamber). The helium lines between the cryopump and compressor are not yet attached. The large gate valve is the thin box that sits between the cryopump and the chamber. The black box above the gate valve is a residual gas analyzer (RGA). (below) The "mini-gate" valve sits on the 16-inch gate of the large valve before installation. Both valves work the same, with a circular "gate" or blade that seals tightly when closed and slides completely out of the way when open. The mini-gate valve is hand operated; the large one is motorized and can be positioned anywhere between open and closed.